We offer a selection of different dance classes for adults ranging from Dance Fitness & Zumba to the more gentle rhythms of Ballroom & Latin, as well as Modern Line Dancing. We welcome all abilities and you don’t need any previous dance experience. Remember – dancing is so much more than just learning a bunch of steps! Dancing can make you feel fitter, stronger and more co-ordinated. At a weekly class you meet new people, make friends, increase your confidence and all this will make you feel happier too. Line dancing is no longer all thigh slapping & ‘Yee hah-ing’ we now dance to all sorts of music from Pop to Latin, Country to Irish! Classes for all levels from Beginner – Intermediate. Classes start at £6. Pay-As-You-Go. High energy Dance Fitness classes that are not just fun to do, but really work. Dance Fitness & Zumba is like a mix of Salsa, Disco, Freestyle and Aerobics – but it’s so much fun, every class feels like a party! Zumba & Dance Fitness boasts many benefits and it’s by far the most fun way (in our opinion) to lose weight, get fitter and tone up. Just let the music move you and let out that inner Dance Goddess! Easy to follow routines with a mix of dance styles and music covering everything from Bollywood to Cha Cha, Samba to Salsa, Cumbia, Banghra, Merengue, Reggaeton, Pop, Disco (including some cheese), 70’s/80’s and more! Classes are suitable for Beginners. Just bring your feet – two left ones will do! We guarantee you will leave the class smiling. All classes are £6 Pay-As-You-Go. A gentle introduction to the different rhythms of Ballroom & Latin covering Waltz, Cha Cha, Rumba, Samba, Tango, Jive and Quickstep. No partner required. 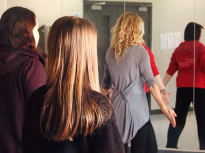 First class is suitable for Beginners and those with none or limited dance experience. The 12:15 class is for those who have mastered the basic steps and are looking for more challenging routines and timings. Both classes are very relaxed, fun and use a whole range of music from the last 50 years. These classes are held at the GOODMAN DANCE ACADEMY (yes, that’s Len Goodman – Strictly Come Dancing & Dancing With The Stars) It’s ALWAYS the season to be Strictly! Each class is £6 Pay-As-You-Go. Do both classes for £8. Text/Call 07811 23467 or email info@dancegeneration.co.uk. Just drop into any class – all classes are FREE to try! We welcome new dancers to any of our classes – just bring your feet – two left ones will do! We want our pupils to enjoy their dancing and look forward to classes. There is never any pressure to ‘get it right’ and we never judge or compare anyone. At DANCE GENERATION we believe that dancing isn’t actually about the steps. Dancing is SO much more than just moving your feet to music! We place as much importance on the health, social and leisure benefits and opportunities that dancing can give our students, as we do the steps. DANCE GENERATION classes are about making new friends, moving your body, expressing yourself, getting fitter and enhancing social and life skills, gaining confidence, having fun, learning a new skill and enjoying the music!